There are four fish we chase around this lake of ours. They are the Kokanee Salmon, Brown Trout, Lake Trout (Mackinaw), and Rainbows. The catch is limited to any combination of five fish per person including a maximum of 2 Mackinaw. The Kokanee is a landlocked version of the Sockeye Salmon. It has adapted well to Lake Tahoe and spawns regularly in Taylor Creek during the fall. Kokanee typically have a four year life cycle and the average catch is about 1.5 lbs. They typically school near Taylor Creek at certain depths with comfortable temperatures. 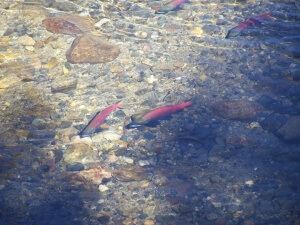 The Kokanee season is from July through October. Rainbows are among the most common fish in the Sierras due to the large amount of plantings from the Department of Fish and Game. There is typically a pink iridescent band down the middle though those from Lake Tahoe tend to be more silvery. 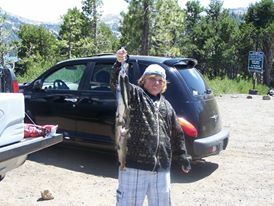 Rainbows are caught in Tahoe up to 25 lbs. There are typically dark brown spots over the upper half and the entire tail. 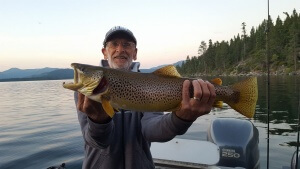 Often referred to as German Browns, this trout is also common in Lake Tahoe and it’s tributaries. Similar in size and shape to the Rainbows, Browns can be easily identified by the halo effect around the spots, especially on the gills. The skin color is golden brown and the spots can be both red and brown. The Mackinaw is the grandaddy of Lake Tahoe’s fish. The average catch is about 4 pounds with fish twice that size being common. 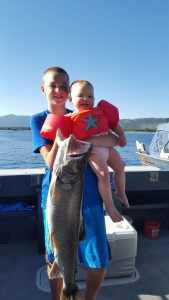 The California state record for a Mackinaw is a 37 pounder caught right in Lake Tahoe. Electric down riggers are used for Mackinaw fishing since they are known to inhabit the deep waters of the lake.